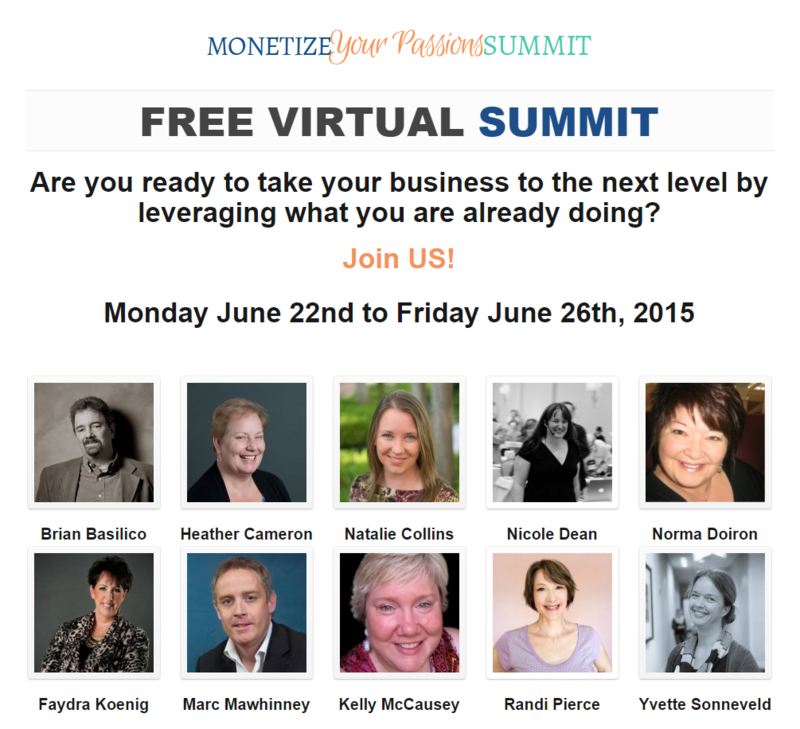 The week of June 22, 2015 is the FREE 2015 Monetize Your Passions Virtual Summit and our theme is LEVERAGE. If you’ve already joined the summit, thank you very much, if not, you don’t want to miss out we’ve got an amazing line up speaker and topics. This year’s theme, Leverage, emerged from realizing that all business owners need to use what they are already doing today and what is available to them to work smarter, not harder. The benefits need to be the benefits to you as a business owner first and secondly to your clients. Why? Because if you don’t take care of your business and make enough money to support the lifestyle that you want, then you won’t be available to provide the best product/service you can to your clients. If what you are doing isn’t leading to a sale, then why are you doing it? What is the benefit to your business? I see many business owners fall into the trap of working on things that are not going to generate them revenue and then they wonder why they are not making the money they need. Step 3: Keeping asking yourself: “How can I use what I’m doing now and leverage it in other ways. For example, if a health coaching is finding that she is giving very similar exercise to her clients one-on-one with amazing success; she could easily leverage that knowledge and skill and deliver that exercise in a group or self paced way. What results would you see in your business if you focused on those 3 steps weekly? How would it change things for you? Please share below. 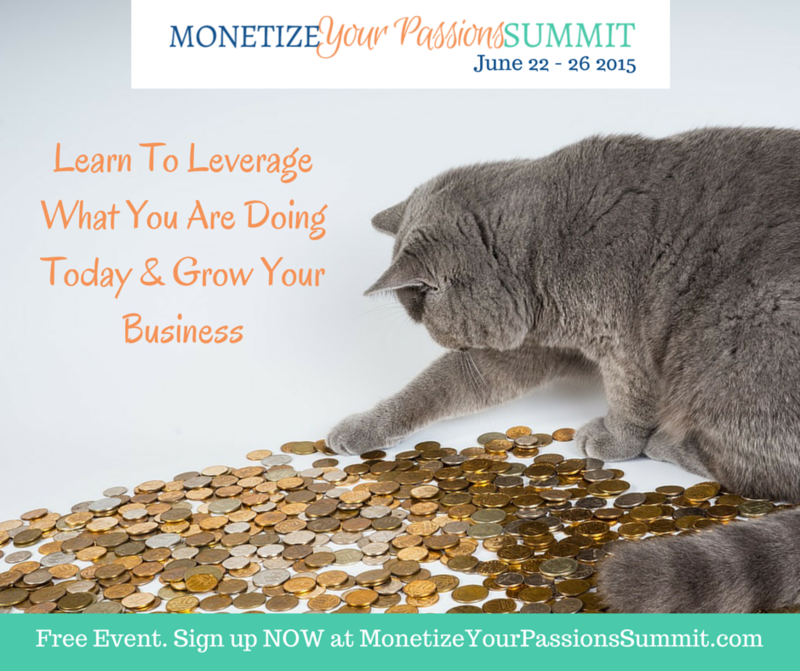 All of the presenters, including myself, are passionate about helping you to learn how to monetize your business in order to serve more people with your unique skills and gifts. WHEN is all this happening? Starting Monday, June 22th until Friday, June 26th, you will be able to take part in two teleseminars each day, at 11:00 a.m. EST (8:00 a.m. PST) and 3:00 p.m. EST (noon PST). Each interview will be 40-60 minutes in duration, AND, as an ADDED BONUS, each interview will be recorded and accessible FREE for during the summit. So visit the website and check out the cutting edge speakers who are ready to share their expertise to help you make money doing what you love. And, should you feel so inspired, feel free to pay it forward and share this invitation. Excellent tips! I am constantly in search if more ways to leverage my time! Love this blog post! 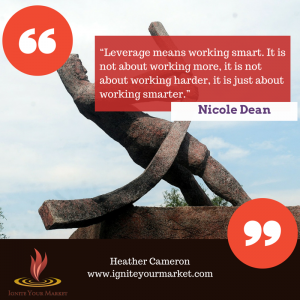 Thanking about “Leverage” is so important in order to build a business. What we can not change is that we all have 24 hours a day and 7 days a week…… and we need to sleep, so to build up a business and help more people, “Leverage” is the key. This is why I made a shift to online coaching from face-to-face training. Thank you for sharing! Kaz – Great example and glad to see you doing the shift. I keep telling my father, we don’t control time, it move along one second at time. It is what we do with that time that matters. Great post and thought-provoking as well 🙂 Asking these questions are so beneficial to your success online, and if we are not creating the kind of revenue that we want to then we definately need to improve our skillset and learn a better way to increase our conversions on our blogs so we can get that benefit of generating more revenue weekly, or monthly. Thanks for sharing these great tips to sparking leverage in our businesses to help us to generate more leverage! Thanks Joan, It is all about increasing our conversions and taking care of your business so it can serve others. Smart to focus on the power of leveraging. It’s easy to get bogged down in details and not realize that you’re working too hard for the ROI – great reminders. Deb that exactly it. We don’t have to work so hard, we have to work smarter! Yes, I did sign up for your tele summit, Heather, and congratulate you for organizing it and brining it to life. Love the definition of “leverage” you offer, as I also believe that the key in all areas of our lives is to maximize and multiply our efforts/resources. As one of the quotes says, about working smart. This is one of the possible advantages of social media that I see. It becomes easy to reach out and connect with a large number of people in a concentrated space. All the best with the tele summit and I hope it is wildly successful for everyone who participates. Thank you Beverly. The Summit was great and the recording are still available for people to listen to. Leverage is key to success in many different aspects of our life. Great point. Social Media is a great example of doing something once (writing a blog) and sharing it all over the place. These are great questions to ask yourself as a business owner. Leverage is key to long-term growth and profitability. Love it! Leverage is absolutely the key to longer term growth. Every business owner needs to be thinking about it. Ian – I’m glad it help. Group coaching can be so powerful. Not only does it help you leverage your knowledge but each participant help add value to the program.